The relaxed vibe, friendly locals, and beautiful scenery of New Zealand brings people from many cultures together to live in harmony. It is the perfect place to visit or even move if you are thinking about relocating. 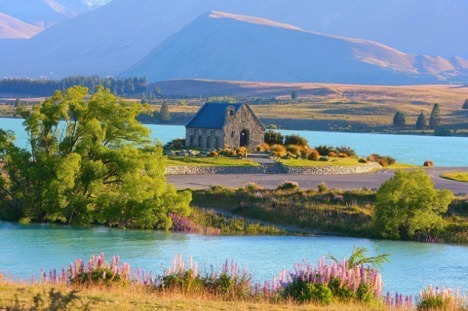 If you have never had the pleasure of visiting New Zealand, here are the top seven amazing reasons we think it is where you should visit next. Volcanoes, glaciers, beaches, and bright green countrysides make for a great adventure and picturesque backdrop for nature lovers of all kinds no matter where you are in New Zealand. You can hike one of three volcanoes and see glorious waterfalls in Tongariro National Park or visit New Zealand’s 90 miles of beaches for a dip in the ocean. You will always be able to find something to do on the weekends and take an amazing selfie to showcase your exciting lifestyle. You will definitely want to secure a job before you make a big move, and that should be easy in the country’s thriving economy. With high ranks in health care and an employment rate of 76%, the quality of living tops many other countries. Auckland, Wellington, and Christchurch are just a few of the country’s major cities that offer great employment opportunities if you are thinking of making New Zealand your permanent home. For info on moving to this beautiful country, you can check out online resources like https://www.movingtonewzealand.com. Whether you are a lover of bundling up for cold temperatures or soaking up the warm sun, New Zealand has a lovely climate with rich seasons. Most of New Zealand has mild temperatures, while extreme areas experience subtropical summers and freezing temperatures. You’ll surely find an area where you feel comfortable with the country’s varying climates. If you are a lover of the arts, New Zealand has plenty to offer with more than 20 public art galleries and more than 70 museums, many of which are completely free. These museums and galleries have a wide range of subjects, from 3D optical illusion artwork at the 3D Trick Art Gallery, perfect for your Instagram feed, to historical villages and gardens at the Howick Historical Village where you can learn about the origins of New Zealand’s culture. There are also exceptional annual festivals, like the Tremains Art Deco Festival in Napier, unlike anything you’ll find anywhere else in the world. Residents of New Zealand are overwhelmingly known for their hospitality and friendliness. It will be easy for you to strike up a conversation with your new neighbors and other locals. The people of New Zealand are very welcoming, which will put you at ease while you settle into an unfamiliar country. Safety is a main concern no matter where you are. New Zealand was rated the world’s second most peaceful country in 2017. The crime rates are low, the police force is known for being extremely trustworthy, and New Zealand is one of the least corrupt countries in the world, so you can rest easy. The wildlife in New Zealand is an animal lover’s dream come true. You can go whale watching, see penguins and seals, go horseback riding, visit a local farm, or even book a tour to see the glow worm caves of New Zealand. There are nine wildlife parks and zoos throughout the country where you can see animals of all kinds including parrots, pigs, tigers, and the national bird of New Zealand, kiwis. The wildlife in New Zealand is all around you, just a short trip away from home. The journey to New Zealand may be a long one, but it’s well worth it! Whether you go for the awesome ecotourism or the gorgeous weather, you’ll quickly learn that it’s great to be a Kiwi.